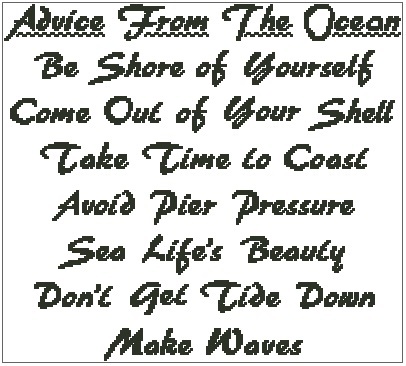 Advice from the Ocean (no back ground) is an font only chart measuring 198 stitches wide by 178 stitches high. If you would prefer, this chart is available with a full colour background of the ocean, and can be found in the Full Colour section on the website. This design is also available as a kit. Please see the 'kits' section for more details.